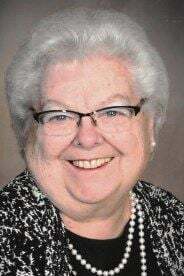 CHAMPLIN, Minn. — Betty Tommerdahl-Dickinson, 81, of Champlin passed away peacefully Monday, Feb. 4, 2019. Preceded in death by husbands, Marvin Tommerdahl and Robert Dickinson; and brother, Daniel Bathke. Survived by sons, Brian (Julie) Tommerdahl and Brent (Susan) Tommerdahl; grandchildren, Charles (Sarah), Ann (Jeff), Emily (Brent) and Ellen (Tom); great-grandchildren, Claire, Elsie, Nora, Adaline, Anja, Weston and Baby Boy Tommerdahl; siblings, Donald Bathke, Franklin (Sue) Bathke, Charles (Vonnie) Bathke and Fay (Grant) Lyberg; and many other relatives and friends. Visitation 4 to 8 p.m. with a prayer service at 7:30 p.m. Friday, Feb. 8, at Evans-Nordby Funeral Home, 6000 Brooklyn Blvd., Brooklyn Center, MN. Funeral Service 11 AM Saturday, February 9, 2019, at Brooklyn Ev. Lutheran Church, 5840 69th Ave. N., Brooklyn Park, Minn., with visitation one hour prior to the service at church. Private interment in Eagleton, Wis.